"The Gershwins' Porgy and Bess explores the relationships between members of a close-knit community in 1920s South Carolina. 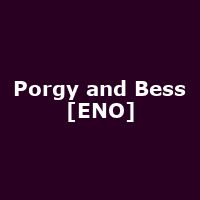 More than 80 years after its premiere, Porgy and Bess receives its first ENO staging. Written for a large cast, with a 40-voice chorus specially formed for this production, and full orchestra, Porgy and Bess is infused with unforgettable melodies, including the much-loved 'Summertime'. This is a stage work that is emotionally charged, powerful and moving, delivered through jazz, ragtime, blues and spirituals. "